Seen when attempting to compress a folder or file using Windows Explorer. File not found or no read permission. This is not really a permissions error at all! 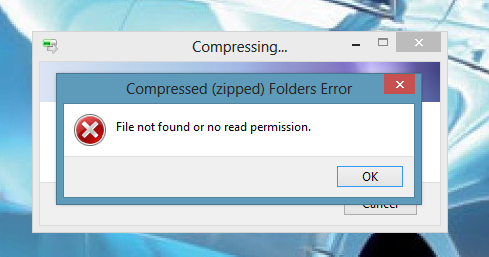 The built in Windows Explorer compression tool does NOT LIKE large files and folders. Unfortunately that’s a limitation you are stuck with. But there is nothing to stop you using the free and much better compression software 7-Zip, and that will do what you want.